Many of the previous archaeological studies on prehistoric religion have tended to view it from a “top-down” perspective of the ruling populations and consider it to be a means for promoting the sociopolitical power and hegemony. In this paper, I would rather attempt to integrate the agency/practice-based “bottom-up” perspective of the ruled. With a primary emphasis on detailed contextual information, the historical developments of individual or group activities, as dialectic interplays between structure and practice, will be explored based on the data gained from the excavations during the 2006 and 2008 field seasons by the Sicán Archaeological Project (SAP) at the Site of Sicán, northern North Coast or Peru. "Tools of the Trade" presents a collection of academic papers from the 2005 Chacmool archaeological conference which includes a wide range of contributions from international archaeologists, senior professors and students alike. Each chapter focuses on the discussion and application of unique and innovative 'tools' for archaeological analysis and interpretation, including micro- and macro-botanical analysis, experimental study, off-site survey, lithic use-wear, ceramic petrography, DNA analysis, chaine operatoire, space syntax, and Geographic Information Systems. 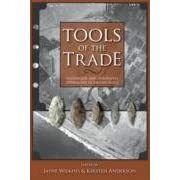 As a collective volume, "Tools of the Trade" also covers an impressive diversity of geographic regions and time periods, such as Precolumbian Mesoamerica, Plio-Pleistocene Africa, prehistoric and historic North America, and ancient Polynesia. Finally, this volume provides a somewhat introspective look at the origins of tool use, technological development, and the means by which we have become the only species to ask the questions: What does it mean to be us and how can we find out?